Located in park past county hwy D off State RD 80 in Rockbridge, WI. 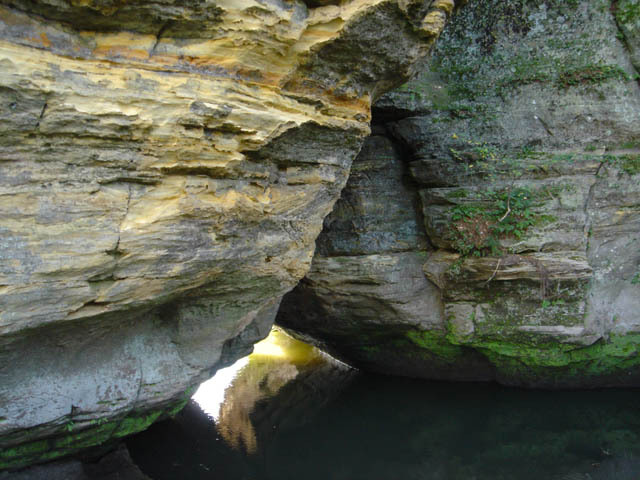 Coordinates Lat N 43:26'7237" Lon W -90:21':780"
One of the largest natural bridges in Wisconsin, Rockbridge is 20 feet wide and 10 feet high. 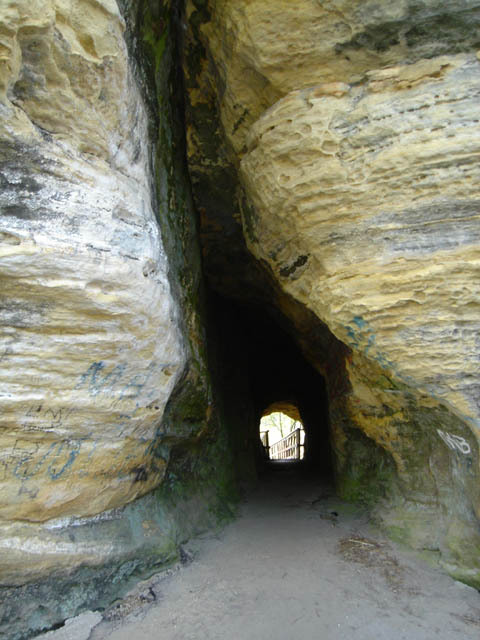 Archaeological investigations have revealed that the bridge's sandstone overhang was once used as a shelter by Native Americans. Through the efforts of local citizens. 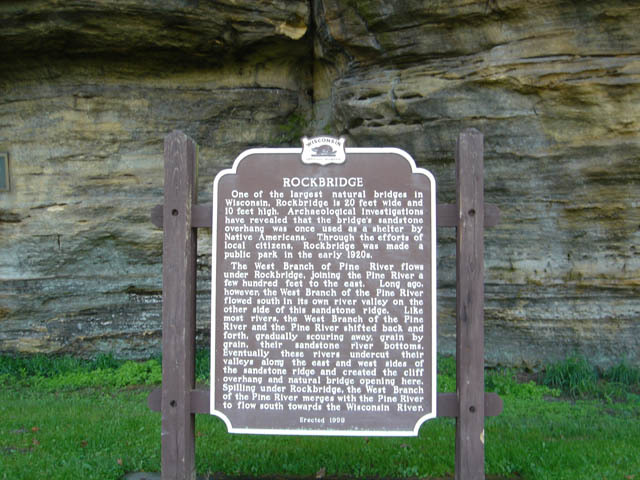 Rockbridge was made a public park in the early 1920s. The West Branch of Pine River flows under Rockbridge, joining the Pine River a few hundred feet to the east. Long ago, however. 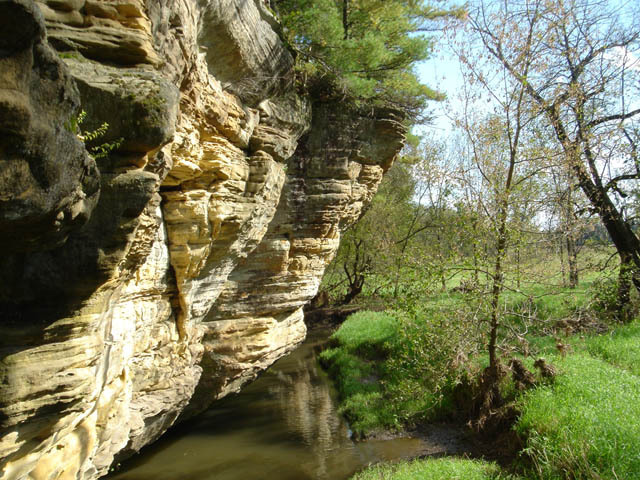 the West Branch of the Pine River flowed south in its own river valley on the other side of this sandstone ridge. Like most rivers, the West Branch of the Pine River and the Pine River shifted back and forth, gradually scouring away, grain by grain, their sandstone river bottoms. Eventually these rivers undercut their valleys along the east and west sides of the sandstone ridge and created the cliff overhang and natural bridge opening here. Spilling under Rockbridge, the West Branch of the Pine River merges with the Pine River to flow south towards the Wisconsin River.